Each summer I make a lemon meringue tart, or two. This year I’m on a bit of a tart bender, but my family’s not complaining. 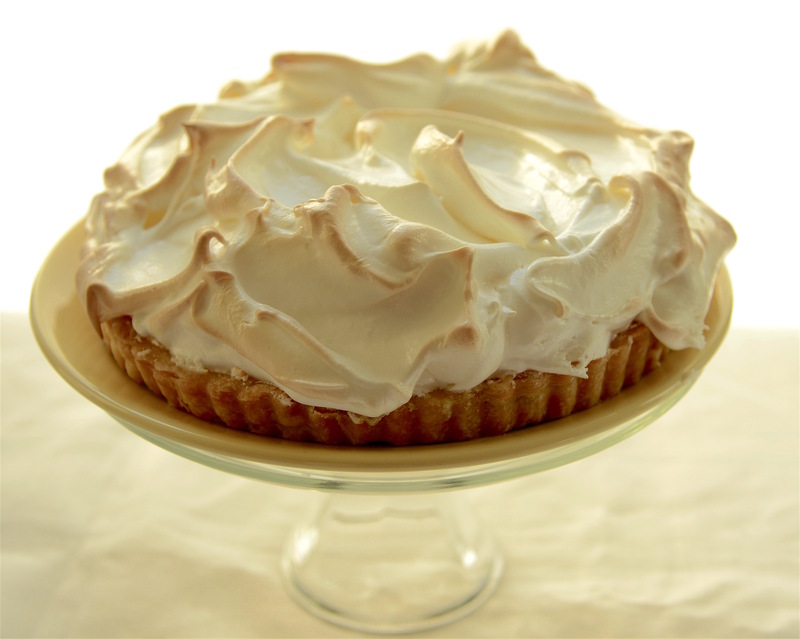 Lemon Meringue is easy, but it can be temperamental. I’ve had my share of pie fails, so I have a few handy tips to pass along. Working with a fluted tart pan with a removable bottom is far easier than using a standard pie plate. If you dust the pastry with sugar before baking the empty pie shell, the sugar will form a light seal and prevent the custard from seeping through. Lemon custards sometimes fail to firm because the cornstarch has been cooked too long, negating its firming properties. Too much lemon can also play havoc with the custard. Stick to the recipe, and you won’t have a soupy pie. Italian Meringue yields the most stable meringue. Making it is a straightforward process: heating the sugar until it reaches a soft-ball stage, then adding it to the egg whites. It’s not difficult, but you’ll need to invest in a candy thermometer, if you don’t already have one. Finally, don’t attempt meringue on a humid day. The pie gods will make you and your pie weep. One recipe flaky pastry pie dough, baked in a fluted pan, and cooled (recipe below). You’ll have leftover pastry dough with this recipe, but you can freeze the remaining dough for later use. Place the egg yolks in a medium bowl, whisk lightly, and set aside. In a medium saucepan, combine the cold water, cornstarch, sugar, and salt. Whisk together over medium heat, stirring constantly, until the mixture comes to a simmer. Remove from heat and carefully pour about half the sugar mixture into the bowl of egg yolks. Mix well, then pour the tempered yolks into the saucepan containing the rest of the sugar mixture. Add the lemon juice and bring to a simmer, stirring constantly for one full minute. Remove from heat and stir in the butter. Allow to cool for a few minutes, then pour the still-warm custard into the baked pie shell. In a small saucepan, combine the sugar, corn syrup, and water and mix well. Bring to a boil over medium heat until a candy thermometer reaches 240 F. To prevent the sugar from crystallizing, dip a silicone pastry brush into water and brush down any sugar that sputters to the sides of the pan. Once the sugar mixture reaches the correct temperature, immediately add it to the egg whites, in a small steady stream, all the while running the mixer at high speed. Continue to whip until the whites have expanded and formed billowy, glossy peaks. Spoon the mixture over the still-warm custard, in great globs, creating loose freestyle peaks with the back of your spoon. Be sure the meringue is spread out to the crust; otherwise the meringue can slide off the custard. Place the flour and salt in a large bowl and mix to combine. Cut the lard or shortening into 1 – 2 inch pieces and add it to the flour mixture. Cut the fat into the flour with a pastry blender or two knives until the mixture is crumbly with some larger pieces among the (mostly) finer particles. In a measuring jug with a spout, combine the egg, vinegar, and enough ice water to equal 1 cup; mix with a fork. Gradually pour about half the liquid into the flour and mix with a fork, adding only enough additional water to make the dough cling together in an untidy mass. You won’t use all the water; you’ll have anywhere from ¼ – ½ cup left over. When the dough becomes too difficult to mix with a fork, transfer the dough to a lightly floured work surface and shape into a disk about 1” thick. Cover with plastic wrap and refrigerate for at least an hour. Transfer the chilled dough to a sheet of flour-dusted parchment. Roll the dough to about ⅛” thick, rolling from the centre toward the pastry’s edge in all directions. If the dough sticks to your rolling pin, place a sheet of plastic wrap on the dough and roll over the plastic. Using your fluted tart pan as a guide, cut the dough about an inch wider than the pan. Line the pan with the pastry, and press the dough against the fluted edge. Trim the edges. Remove the plastic wrap and, using a fork, poke a series of holes in the pastry. (This will prevent the pastry from buckling during cooking.) Cover the pastry with tinfoil and fill with about 1 1/2 cups of pie weights (or dried beans). Bake the pie shell in a 375 F preheated oven for about 10 minutes, then remove the foil. Sprinkle the pastry with the sugar and continue to bake until completely cooked, about 20 minutes in total.